This post was written by JMM School Program Coordinator Paige Woodhouse. To read more posts from Paige, click here! At the Jewish Museum of Maryland, we are stories tellers. We are also storyfinders, storykeepers, and storyprotectors. We are thrilled to share the poignant story found in Stitching History from the Holocaust on loan to us from the Jewish Museum Milwaukee. This exhibit brings to life the dress designs by Hedy Strnad, who perished in the Holocaust. In doing so, the exhibit aims for visitors to see that each victim of the Holocaust has their own story that deserves to be remembered. 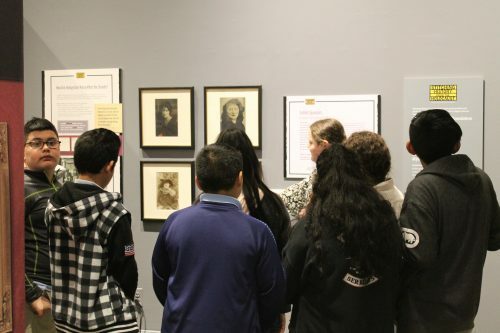 When students from John Ruhrah Elementary Middle School visited this week, they did not just hear the story of Hedy Strnad but took a behind-the-scenes look at how this story came to be. Many stories begin with a question, a discovery, or someone’s desire to know something more. In the case of Stitching History from the Holocaust, the story began with the discovery by Burton Strnad of a red envelope containing a handwritten letter, a black and white photograph, and eight dress designs. Burton Strnad gave these items to the Jewish Museum of Milwaukee, who then began to piece together the story behind the couple in the photography, Hedy and Paul Strnad. 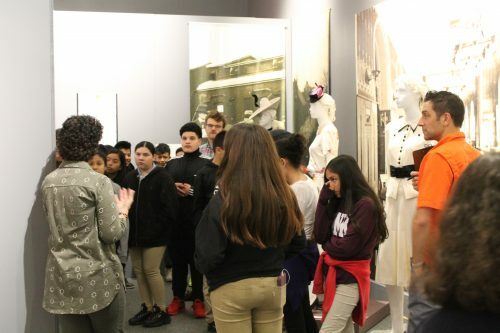 6th-grade students from John Ruhrah taking a close look at the dresses on display in Stitching History from the Holocaust, on loan to us from the Jewish Museum of Milwaukee. Sometimes stories don’t begin with just one question. They begin with lots of questions. Students stepped into the shoes of Burton Strnad and the staff at the Jewish Museum of Milwaukee. Imagining they made this discovery, students pondered what would they want to know about these items and the people that they belonged to? Students came up with the questions: Who were the people in the photograph? What did they do? What happened to them? Where did they come from? Are they related to me? How did the letter get there? Who made the dress designs? Students thought about how they would find the answers to their questions. They could talk to family members, search on the internet, go to the library or a museum. All great ideas (especially the Museum suggestion). Hedy and Paul’s story is told using dresses that were fabricated from the designs found by Burton Strnad. Students discussed how the dresses represent a family’s attempt for survival. They represent a profession. A talent. An individual. They are a memorial for someone’s talent and potential that was lost because of the Holocaust. They allow Hedy and Paul’s story to live on and pass from generation to generation. The story of Hedy and Paul is still being uncovered by the Jewish Museum of Milwaukee. As new pieces of information are discovered, the Museum is able to fill in the blanks. Students considered what else they wonder about the dresses and the Strnad family. Students asked: How did Hedy and Paul die? How old was Hedy? Are there any traces of her dress shop? Are there other designs or photos? How long did it take to make the dresses? Students working with JMM Educator Marisa to think about what they would still like to know after learning about Hedy and Paul Strnad. Exhibits are three-dimensional storytelling environments that you can move through and interact with. Unlike the paperbound novels that students are reading in class, an exhibit immerses them in the narrative. The dresses on display in Stitching History from the Holocaust do just that. They bring to life the Strnad family’s story and allowed students a behind-the-scenes exploration of how Museum’s tell important stories. Finally, the exhibit and the dresses don’t answer all the questions, but left students inspired to find out more. Find out how students created their own stories about clothing items on display in the JMM-original exhibit Fashion Statement, in the next blog post, Fashion Statement: Students as Storytellers Part 2 (publishing on April 11, 2019).